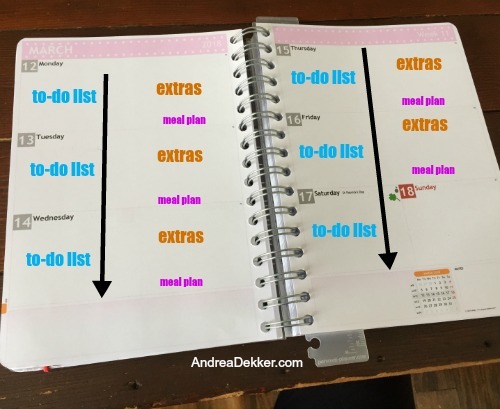 One of the ways I simplify my home, my schedule, and my life is by reducing the number of decisions I need to make on a daily, weekly, sometimes even hourly basis. Personally, I become more stressed, less happy, more flustered, and less patient as the day wears on — answering question after question, making decision after decision ALL. DAY. LONG! After a particularly question-filled day, I often take my shower right after the kids go to bed, in order to relax a bit. After a little time “away”, I feel like I have enough brain power to tackle my to-do list and prepare for the next day. 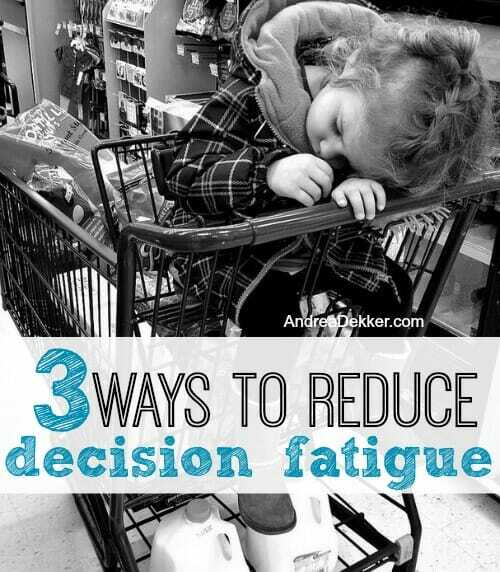 If you feel like you struggle with decision fatigue, I hope the 3 tips in today’s post will help lighten your load and allow you to make fewer decisions throughout the day. 1. Limit the decisions you need to make. This is easier said than done — but it truly makes a HUGE difference. In my own life, I have majorly cut back on the types of clothing I have — I basically wear black, grey, navy, white or bright pink. This way, I know most of my clothing can mix and match, AND (best of all) I can shop our local thrift stores so quickly because they color-code all their clothing! So I just look for my colors, saving me so much time, money, energy and decisions! Another example from my own life — I often eat the same things for breakfast and lunch each day, and rotate a handful of our family favorites for dinner. Fewer choices, fewer decisions! We practice a simple bedtime routine that allow us to get our kids in bed on-time, every night, with little-to-no questions, fights, or arguments. And I try to make our home as “kid friendly” as possible so my children can get their own water cups, wash their own hands, reach their own gloves, and access their own shoes — meaning fewer things I need to do and fewer decisions I need to make each day. And finally, I’ve gotten really good at saying “no” to things, people, activities, events, and organizations that don’t match up with my current season of life, my current goals, and my current energy level. 2. Make necessary decisions in advance. Yes, I know you’re all shocked that one of my tips would be to “plan ahead” but it really is helpful in reducing decision fatigue! I honestly can’t think of any situation or stage of life that wouldn’t be greatly improved by planning ahead. 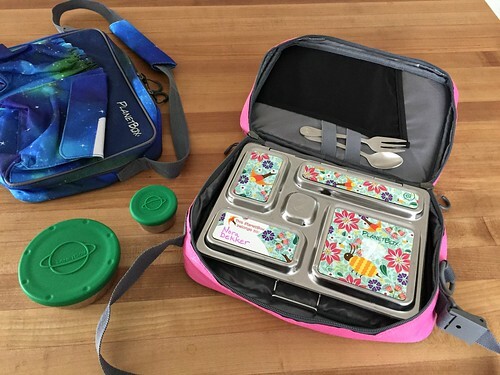 We pack lunches and pick out clothing the night before so there are no questions or arguments in the morning. I plan our dinners by the week so I don’t have to wonder “what should we eat tonight” all day long. Our kids are also weirdly obsessed with knowing “what’s for dinner” so it’s helpful to be able to tell them earlier in the day so they can stop asking me! I make my to-do list the night before so I don’t lay awake wondering if I forgot to do something or if I’ll remember everything I need to do the next day. All of these examples sound very small and trivial — but put them together, and I really save a ton of mental energy throughout the day. 3. Delay unnecessary decisions until a more convenient time. If at all possible, do NOT let yourself be guilted or pressured into doing something you haven’t had time to think about first. Say, “let me think about this and get back to you” or “let me check my calendar” before agreeing to add something else to your plate. I know there are so many great opportunities out there today (and we should all help when we can). However I usually think better and feel less overwhelmed when I can delay any non-urgent decisions until the next day. Similarly, give yourself the challenge of waiting 24 hours before actually spending your hard earned money on something you think you really want to buy. I find that I have a much clearer thought process in the morning, (after I’m able to rest and clear my brain) so if I can delay a decision until morning, I almost always will. These concepts are all very simple. However, they WILL take conscious effort in order to implement them into your everyday life. That said, I’m 100% confident your time and effort will be worth it. Over time, fewer decisions each day will allow you more mental energy to devote to things you actually want to do… not just circulating the 80 bajillion questions, requests, and random facts floating around in your brain! What will you do with all that extra brain space?!?! Yes, yes, and yes. Along with considering season of life, I’ve gotten more in touch with values lately and making decisions strictly in alignment. It feels great! I like that you use the word “values” instead of goals — that puts a different twist on the thought process, that’s for sure! I found you through your guest appearance on the Organize365 podcast and love your blog! One thing we started doing with my 3 & 5 year old girls is picking out their clothes for the week on Sunday night after dinner. They get to pick out their outfits and then present them to myself and my husband in our weekly “fashion show”. They hold up their outfits after a small song or dance and get a yeah or nay from us or suggestions about how to make things match a bit better. After any switches of clothes we put everything in little plastic drawers labeled w the days of the week. They LOVE the special time and they are learning to pick out clothes and plan ahead. And it makes our mornings more peaceful! 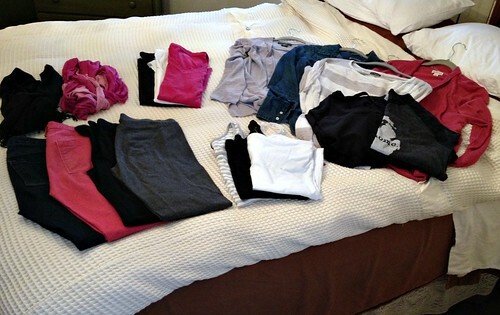 After reading this post I think I need to go purge some of my clothes to make my life easier too! Thank you for sharing! this is awesome — thanks for sharing what works for your family Jen! I have four pair of navy knit leggings and four pair of navy knit capris. All my socks are navy. All three of my winter tees and all six of my summer tees go with navy. I also have a navy jumper and a navy knit dress I keep meaning to turn into a tunic. I have three sweaters that all go with navy. It’s very easy. wow — you are amazing! What a fantastically minimal wardrobe! Great, simple advice. It can be so easy to get overwhelmed, but this really helps! Try it and see! Thanks! My brother gave me the best advice years ago. He said simply, “Just say no.” It gives you time to think about it and if you change your mind, well then— you look like the hero! As an example, when I have said ‘no,’ but then went and helped with whatever on the backside. Trust me, if you show up to an event where they needed volunteers, they STILL need volunteers. Apply this elsewhere, any where needed. Andrea, you just worded this much more politely! It was a game changer for me and took considerable amounts of stress of my plate. I’ve don’t that tons of times but never really thought of it as a strategy. Great advice. I do say no a lot, fearing I’m going to have too much on my plate, then decide later I can do it. You’re right, help is always still needed and welcome.